MARTINSVILLE, VA. April 4, 2013 – SHINE Systems & Technologies (SHINE), a leading intelligence analytics, biometrics, technology integration, and consulting firm attended the NC Best Warrior Competition’s (BWC) Award Ceremony at the Camp Butner Training Site in Stem, NC. The annual event is the final round of competition for soldiers that have won in each of their respective brigades. It consists of many timed physical challenges to test speed, agility and overall strength over the course of three days. Winners are the ones who have accumulated the most points by the end of the third day; they are presented by the Adjunct General of NC, Major General Greg Lusk. 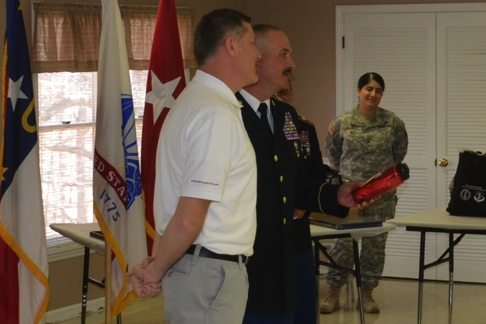 In support of the military efforts, manager of our Martinsville office and recent military retiree, Jon Doss attended the event and congratulated the thirteen participants with SHINE Systems mugs, water bottles, lanyards, pens and candy. For the two winners Doss gifted hats, day planners, thumb drives and $50 certificates. During his presentation, he spoke to them about the importance of their military commitments and explained how SHINE works closely with them, offering career choices after the military. State Command Sergeant Major John Swart introduces Jon Doss as a recent retiree and the previous facilitator/coordinator of the competition.